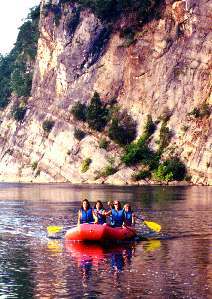 Rafting on the South Fork of the Shenandoah is a great ‘flat water rafting trip’. The trip does go thru Compton’s Rapid for a little wave action. Rafting is a little faster than tubing but 1/3 slower than canoeing. The water levels and trip length determine the time on the river. Numbers below refer to our River map. Our rafting trips are unguided, great beginner trips. or #16 to # 19–3 miles, takes about 2 1/2 to 3 hours. You can begin any time after 9 Am and need to depart before 1 PM for shorter trip. 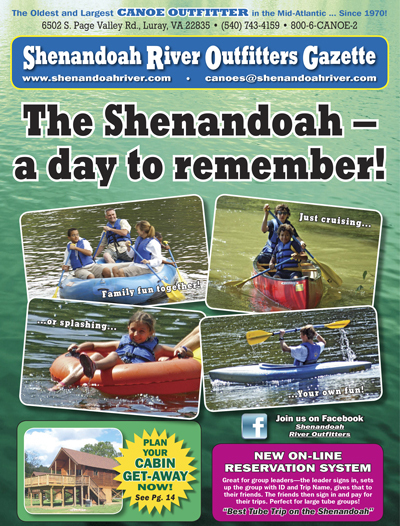 We do not put people together so just bring all of your family & friends for a fun day on the Shenandoah River. Plan to bring a cooler for lunch and maybe your fishing pole, too. You can call in to reserve or go online. Rafting is great for families with small children. Rafts do not turn over like canoes or kayaks can! Some folks rent a raft with tubes when they have small children so the trip goes faster for the small ones. We allow children as young as 3 years old in a raft but no younger than 5 year old in tubes. We do not allow dogs in rafts due to puncture possibilities. You can take dogs in canoes and if small, in kayaks. Reserve online or give us a call. You can add Steak Dinners with rafting too! Cancellation is 48 hours in advance for refund and will need to be called in to the Outfitters.All trips are subject to change due to water levels. We go rain or shine. Virginia has ‘no drinking in public’ laws. We want everyone to be safe on and off the River. We reserve the right to check coolers. Open containers in public and in National forest boat landings may result in tickets. Please no glass on the river.